This tour highlights the nineteenth century private residences found in the eastern side of the city, many which are significant for the particular architectural style they represent. Some are also notable for the well-known South Australians who called them home. Highlights include Rymill House, home to the Rymill family and an important example of Queen Anne architecture of the nineteenth century. 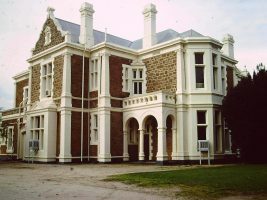 Also included in this tour is the Victorian Italianate architecture of Bray House, the home of South Australia’s first premier, Sir John Bray and Ochiltree House, a Victorian home of brick and iron construction which was owned by early colonist John Morphett. Today many of these are still private residences or now function as businesses, and unfortunately are not open to public viewing.